Kelsie Swygart is a hero of empowerment — a hero who looks gorgeous both naturally and with makeup on. She’s a nail tech who mostly uses her Instagram to showcase the amazing designs she’s worked on, but she also decided to post a recent selfie that’s jaw-dropping for all the right reasons. After participating in a makeup challenge, Swygart had some of the best, most motivational things to say. Why is this photo important? Well, Swygart proved that she’s comfortable with, or without, makeup. And she looks fantastic either way. But even better, she showed how comfortable she is in her skin. While many people try to hide their freckles with foundation, natural skin is so incredibly beautiful, and should be shown with pride. Yet, women don’t necessarily wear makeup to hide something they’re not proud of — they wear it for other reasons, as well (and those reasons are none of our business, as Swygart points out). 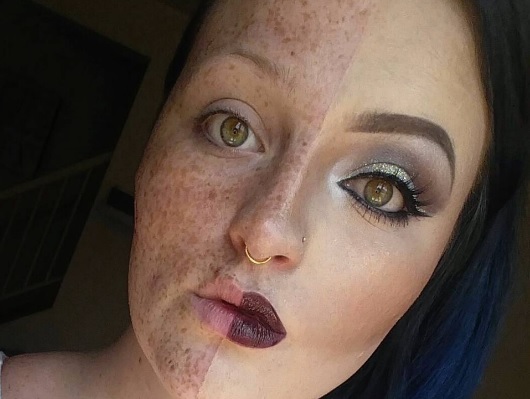 The response to Swygart’s photo was so huge that she decided to start a whole new Instagram account, which focuses on how makeup can help you transform in a super fun, creative way. “With the overwhelming amount of positive reactions I have received from my #thepowerofmakeup post, I have decided to create a makeup account on Instagram!” she said in an Instagram caption. You can continue to follow Swygart (and check out her incredible nail art) here, or see her brand new account (called “freckles and full glam”) here.